The NBR Class G locomotives were introduced by Drummond. The first two were purchased in 1882 from Neilson & Co, to their standard design. Originally purchased for dock shunting, they proved to be eminently suitable for light shunting in both docks and the Scottish lowlands. A total of 38 were built, with the last being built in 1899. Although the term "pug" was used for different engines on different railways (eg. 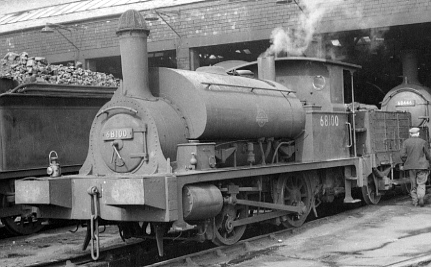 the Caledonian men called all tank engines "pugs"), the NBR reserved the name "pug" for these engines. Typically, the Y9s were driven by youngest drivers and firemen. However, senior men would also be posted on the Y9s for health reasons, or as a form of demotion for misdemeanors on the mainline. Apparently more than one driver known for speeding, ended up spending a number of years shunting Y9s at Leith Docks! Rebuilding with new boilers started in 1913. Nos. 308, 343, and 344 were withdrawn in 1921/2, and had not been rebuilt. Five had not been rebuilt by Grouping: No. 1103 was withdrawn in 1923, whilst the other four were rebuilt in 1923. At Grouping, the LNER classified them as Class Y9. No. 10087 was withdrawn in 1938, and the remaining 33 survived until 1953. These were withdrawn between 1953 and 1962. Due to the small size of the coal bunkers (18cwt), various 4-wheeled wooden coal carriers were used as tenders. When used, these were connected with a conventional three-link coupling. For main-line running, two safety chains were added. In 1939, No. 9308 had its rear buffers removed, and a central drawgear added, so making the tender a permanent fixture. In 1944, Nos. 9011, 9063, 9144, 9146, and 10083, also had central drawgear fitted. Heating Surface: Total: 788 sq.ft. One Y9 has survived into preservation. LNER 9042 (NBR 42; BR 68095) has been preserved by the Scottish Railway Preservation Society and is kept at the Bo'ness & Kinneil Railway. The Hornby Caledonian Railway (CR) 'Smokey Joe' model is based on a series of locomotives ordered by the CR from Neilson. These are essentially the same standard Neilson design as the Y9, but differ in a number of details including the buffers, safety valves, and cab side sheets. It should be possible to adapt the Hornby model into a Y9. Thank you to the P.H. Groom collection for permission to use the above photograph of BR No. 68100.